so not sure why the IF statement inside my above workflow is being ignored? so even if the "Responsiblity ID" equals RES[ItemID], the workflow will update the item. I have done a test in SharePoint online, i create a SharePoint 2013 platform workflow like the following and choose "Automatically update the workflow status to the current stage name". I create an alert on the list which send me alert with all changes. 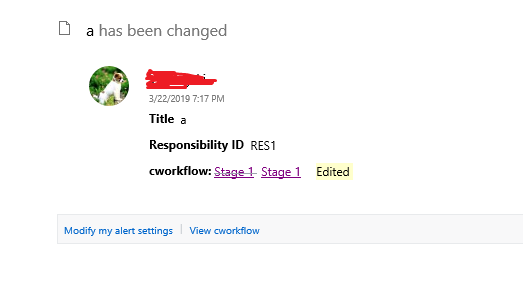 After i run the workflow, both the version and modified are changed, i receive an email alert which indicates the Stage1 has been changed. So the problem is that if we choose "Automatically update the workflow status to the current stage name", it will change the Stage1 which results to the items be changed,then the version and modified are changed. Not the answer you're looking for? Browse other questions tagged sharepoint-online development workflow-manager workflow2013 or ask your own question.